I did a little color comparison for you of Aquamarine and Angel Blue and decided to throw in some Snorkel just for fun. All three of these colors have green undertones to them which you really see when you have all of them together. Every time I see Angel Blue in store, no matter the material, it always strikes me how much brighter and vivid it is in person then I expect it to be. It’s a true Tiffany blue where as aquamarine is quite pale. 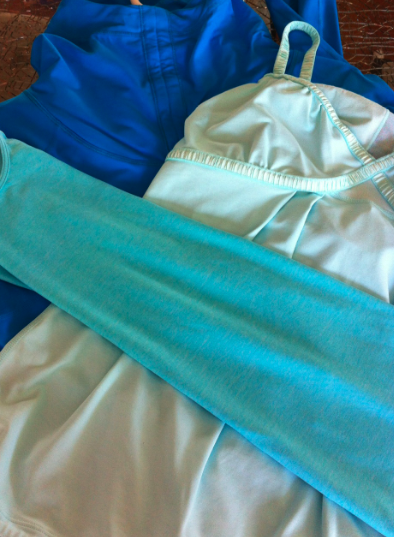 I really love Angel Blue and am hoping the Define Jacket holds out until next month. Please lulu powers that be, next month for the Angel Blue Define. This picture was taken in natural day light, no flash. Snorkel and Aquamarine are both luxtreme and Angel Blue is luon so there is a slight difference in how much light gets reflected. "Split Pea and Angel Blue Turbo Tanks and Heathered Power Purple Vinyasa"
"New! Carry and Go Crops, Run: Catch Me Tank and Turbo Tank and More"